BELOIT – Students are testing out their construction skills and more at Fruzen Intermediate School’s 21st Century Community Learning Center (CLC) after school program, according to sixth grade teacher and CLC Director Dee Dee Arp. 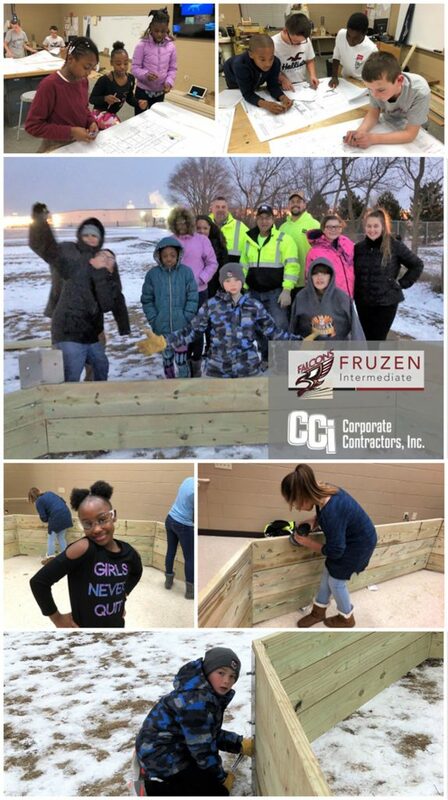 Recently 12 students participated in a construction class with Corporate Contractors Inc.’s (CCI) Lindsey Hartwig and Ty Huffman where they built a gaga court – an octagonal pit where students play a game akin to dodgeball. After winter break, students began a series of eight construction classes. They built the pit on the stage in the school gym. Arp said students and those with CCI constructed a plan and went over tool safety and blue prints. Then CCI created the brackets to hold the court’s corners together and taught kids how structures work. With supervision, students were able to use drills in addition getting more familiar with nuts and bolts. Students finished putting the structure together on Jan. 17. They took it apart and then re-constructed the pit out on the playground. Students also created a video shown on the “Fruze News” to show other students how to play gaga ball.